Every career, especially in entertainment... starts with a dream, is paved by hard work, and pulled along by goals and good luck. "I grew up in a small town near Mount Rainier. I always dreamed of moving to the city and doing something in entertainment since I was a girl. I always sang in the church and school choirs. My mother would give me piano lessons. She thought I was reading music, but I was playing by ear. I picked up my dad's guitar one day, played with some chords and built a passion for it. "I never saw any way other than music since high school. I modeled as a teenager, but that seemed empty to me. I started expressing through song. I moved to Corvallis and found a studio where I could record an album for $25 an hour, just me and my guitar. My friends wanted my CD, and I wound up selling the few thousand I printed. Writing music is easy. It's the promotion that's the hardest part. Eventually, I want to have my own record label and produce my music and help other developing artists. "...Feel free to solo," Rebecca Helmer says breezily, nodding toward guitar player Seth Paul. In the North Seattle living room... Paul is auditioning for a spot in Helmer's eponymous pop band... Helmer, who writes all the songs, accompanies herself on acoustic guitar, and sounds a bit like a lively Sarah McLachlan, was a finalist on Gimme the Mic, KONG 6/16's local version of American Idol. She's tall, blonde, gorgeous, and totally in control. After keeping up amiably through two verses and two choruses, the candidate takes the singer's suggestion and noodles around a bit before seamlessly rejoining the band for a final chorus. "Rest on that D minor," Helmer says, smiling at Paul between verses of her composition, "Flowers from India." Her live shows are whimsical, fun, and fresh. See her next at Northwest Folklife. 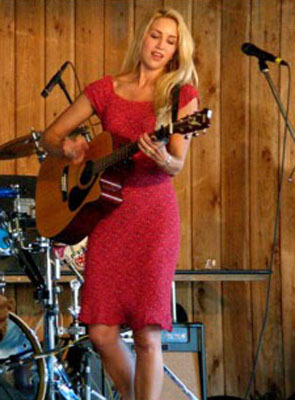 Her music: Rebecca Helmer... has been performing since her early teens as a solo musician. “I sang and played the piano since I was very young. I discovered I could write my own music and taught myself to play the guitar,” she said. Her work is in the genres of pop, rock, and blues. Her songs are drawn from her life experiences; love, loss, dreams, and passions. See her next: At the EMP (Experience Music Project) on April 7. In addition, you can see her compete in a contest on “Evening Magazine” on KING-TV. The contest will air on March 21 at 8 p.m., and will include 35 top local performers. To keep up with Rebecca Helmer, you would have needed to start singing at an early age, mastered a musical instrument shortly thereafter, and all the while flexed your creativity with songwriting. This woman's going places. Without exception, it seems that Helmer has always been on the path to fame from singing as a young girl, to modeling as a teenager, to performing at Portland International Airport, where she caught the ears of representatives from Star Search. Born and raised in rural Washington, Helmer acquired her musical prowess early. "My family has always been musically inclined," she says. 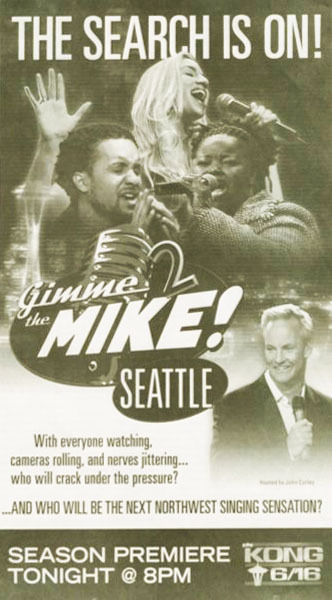 Helmer's venues began with performances in nearby Seattle. It was in Seattle that a chance encounter led to Helmer's marriage to husband and now manager. "I couldn't resist her," he says. "She's amazing. She's so talented and so gifted. Being her manager helps me feel important in some way, contributing to her success. I believe in her - when she makes it big, Rebecca will be a great role model. " Helmer wrote Waiting My Whole Life, available on Helmer's self-titled CD, released last year, for her husband in honor of their wedding. "At first I wasn't sure if I wanted her to sing it, put it on her CD and share it with the whole world because it was so special," he says. "But, I think of it more as her sharing a beautiful thing." With her only compensation being validated parking and CD sales, Helmer agreed to be part of the entertainment lineups. "Singing at PDX was a very welcoming experience," she says. "Complete strangers felt the urge to tell me that my music was good to hear. Employees said that I put people in a good mood before they got on a plane. The employees supported me a lot. I'd love to perform there again." In previous interviews, Helmer expressed her excitement at seeing thousands of passengers traveling across the country, to Europe and Asia buying her CDs. Helmer's performances at PDX had a much more profound impact on many. "Rebecca probably didn't notice people's reactions to her music, but since I was off to the side while she was singing, I could see them laugh and see them cry in the middle of the airport," he says. "Her music has that effect on people." During her performances, Helmer's music drew the attention of several influential contacts, including representatives from Star Search. On the tails of her success, Helmer's talent was quickly picked up by KLSY in Seattle, for their Ultimate Idol contest in early May. Submitting a 30-second audio byte of her singing, Helmer was voted by listeners to perform live in Seattle to win $5,000 and a trip to Hollywood. "Rebecca is in a really prime time," Ethan says. "She'd be perfect for a record company to just grab right now. For one, she's written her songs. Those songs have "
"That's why he is my manager," Helmer says with a bashful smile. Inspired by many artists that have broken through the door of the music industry, Helmer stresses the role of personal and musical integrity in her aspiration for a record contract. Watching the success of the first seasons of American Idol contestants, Helmer considered auditioning, until she grew increasingly aware of the commodity of image the high-rated rags-to-riches contest was promoting. "I realized that they were really auditioning to be molded into something, molded into a pop star singing other artistís songs, not their own," she says. "I want to use my music to get there." Helmer's reputation has been spreading throughout the Pacific Northwest with increasing performances in Portland, Eugene, Corvallis, Seattle, and more. With fans impatient for a second CD, venues eager to book her performances, and her drive to succeed, Helmer may have all she needs to put down her own welcome mat and step through the door to music fame. 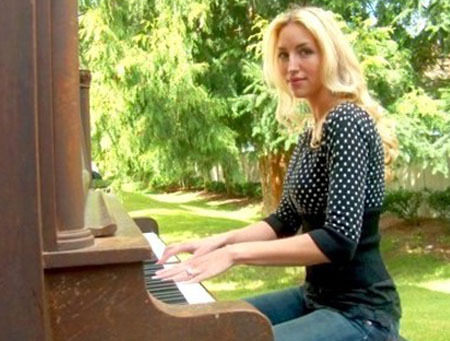 A combination singer, songwriter, guitarist, and pianist, Rebecca Helmer is originally from Washington. Now she and her husband and manager, Ethan, call Corvallis home. They were married in June, an event which several of Helmer's songs celebrate. 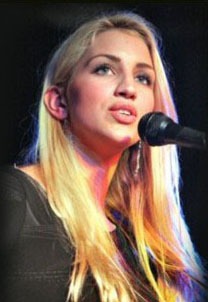 Others of her original tunes are based on various experiences, memories and people. Some ditties are sheerly fictional, imagining an event from someone else's perspective. Once the topic is chosen and lyrics composed, Helmer deftly plucks out plaintive melodies on her acoustic guitar." Helmer has made appearances throughout Oregon with crowds buying out her freshly produced album. Each track boasts Helmer's clear voice, which soars seemingly effortlessly. Completing and complementing is the guileless, gliding guitar. With uncomplicated music and a winning openness, Helmer's shows are delightful, albeit too infrequent. Keep your eyes peeled for her next appearance and enjoy the local talent while it's here.